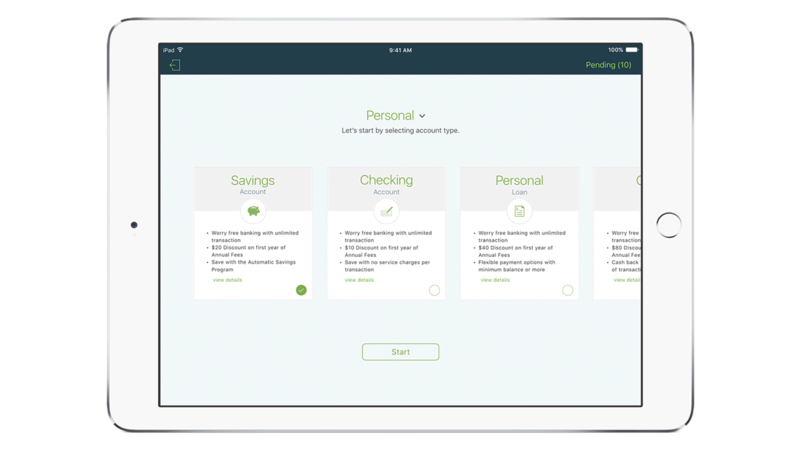 IBM MobileFirst for iOS Open Account enables bank tellers to open new accounts faster and more efficiently than traditional on site processes. Use the iPad’s camera and OCR capabilities to capture initial customer profile information and to complete account deposits. Use iBeacon to authenticate customers as they walk through the door. Enable your customers to step out of long lines and receive an alert instead when it is their turn to speak with a bank teller. Capture profile information with the iPad’s microphone. Empower your bank tellers to reduce the time needed to open new bank accounts. Reduce customer abandonment rates with streamlined and consistent delivery of services. Provide your customers with the capability to open a new account without having to go to the branch office and wait in a long line. Improve your overall banking processes while complying with fraud and regulatory prevention checks. After initial authentication, the app can notify your bank tellers about your customers search history on your bank’s website. This helps your employees to suggest and recommend the best possible products and services tailored and individualized for a customer. Gain new insights and help turn clients’ dreams into reality. Provides wealth advisors with well-formed analytics.